Cart-Away concrete batching systems efficiently load 1-yard portable concrete mixer trailers in 2-minutes. Cart-Away experts have been designing and manufacturing concrete batching solutions for well over 20-years. 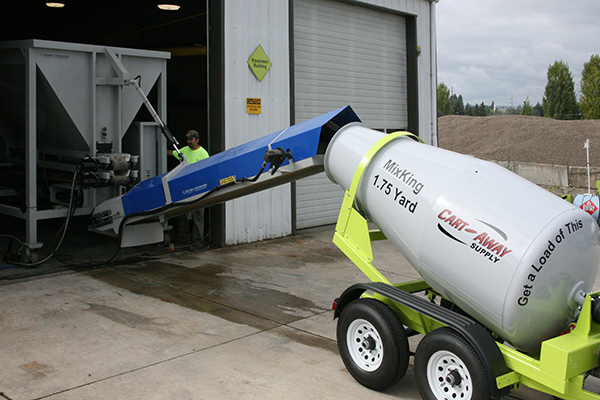 Cart-Away towable concrete mixers can be loaded from a single or multi-hopper unit using computer automation. Cart-Away batch plants are available in stationary or portable all-in-one configurations depending upon your particular application. You can also choose from the portable low volume batch loaders to highly automated batching plants with multiple-position loading conveyors and computer controls. 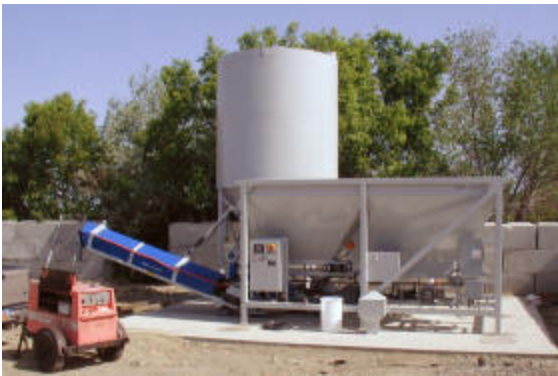 Our batching systems are scaled to a size that will make loading portable concrete mixers convenient and efficient. We can even customize your concrete batching solution to load smaller transit mix trucks, along with your concrete mixing trailer fleet. 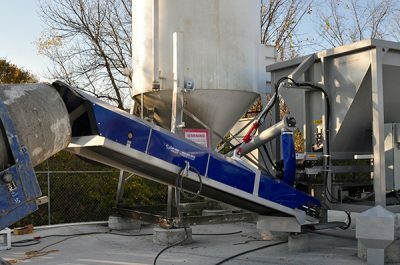 Cart-Away stationary batching plants use a swinging load conveyor that is easily positioned so that multiple trailers can be serviced rapidly by a single operator. Automated batching systems are designed to batch up to 30 yards per hour and are calibrated for cement, sand, and gravel batching accuracy. In addition to the Cart-Away line of automated loaders, we also offer portable concrete batching plants that include low volume loaders and remote batching solutions. These units typically are moved from job site to job site or are used in yards where space is a restriction and stationary units are not an option. Our staff of concrete experts will assist you in choosing the appropriate batching system for your needs. We have assisted hundreds of operators to get up and running with a batch plant that will help them to be efficient and profitable. You will find that Cart-Away builds quality into every batching solution that we deliver and we strive to help you make money with every yard of concrete that you batch. Hundreds of Cart-Away customers have proven that selling ready-mix concrete in small quantities is a very profitable business or addition to an existing business. Rental yards, Landscape Material yards, Hardware and Lumber yards find profits selling freshly batched concrete to their existing customer base. 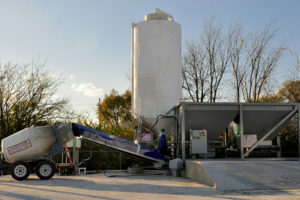 They also discover that having a concrete batching system for small loads brings them new customers as well. 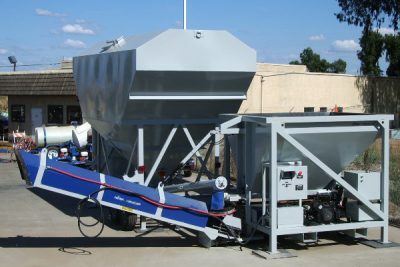 Cart-Away’s small concrete batching and loading systems when teamed with Cart-Away mixing trailers or small ready-mix trucks have proven to be a highly profitable business and one you should explore. Units are available depending on your specific needs. Double hopper units have the ability to carry multiple aggregate mixes or to blend two different aggregates. Allows the conveyor to move in a 120-degree arc and load trailers from different positions. Allows as many as five trailers. This can save time on a busy day. The swing-arm conveyor can move quickly between the pre-positioned trailers. 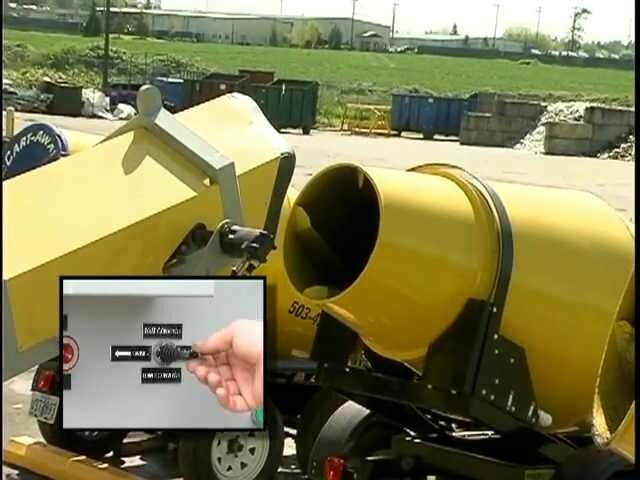 Loads a yard of dry concrete material into a rotating drum trailer in two minutes. Loads material into the mixing trailer drum to yield a much cleaner concrete operation. Gives the tractor operator a bigger target during loading and keeps the mess out of the yard. Piles of gravel on the ground are common with older systems. Cart-Away batching systems are designed to load concrete mixer trailers of 1-yard or larger. Cart-Away will assist you in making money with portable concrete mixers. We can build you a fully automated batching system that will build strong sales for your business.